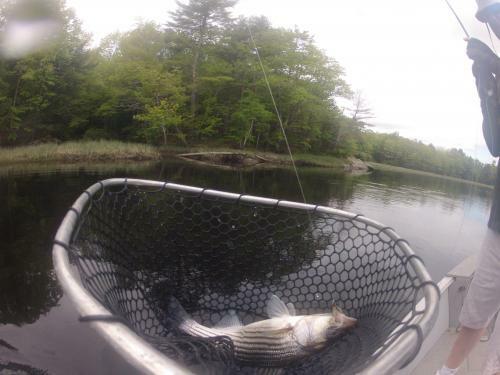 Stripers are still very much around not in the big schools of summer but a few fish almost everywhere spread out at all of the likely sports in the river. I spent a couple of hours on the water casting to some of my favorite spots and wound up with 10 fish to the boat; yes I missed a few. Lucky for me none of you were there to ask me “what was wrong with that one?” All on flies with a few on surface poppers as low tide got closer. Sorry no pictures just this recycled one from earlier this year. The H3 certainly lives up to the advertising claims and performed well with the big flies I like to cast and the nice run of 20 to 26 inch fish this morning. All in all a great morning to be out. I have a few days open next weekend and the following week if you would like to take part in some of this late season striper fishing of bass fishing on freshwater for that matter.